Third revised edition, loaded February 2, 2017. Brahmâ said: 'After having congratulated the four sages of yogic conscience for their words of praise, the Almighty One from the abode of Vaikunthha spoke. The Supreme Lord said: 'These two attendants of Mine named Jaya and Vijaya have, by their contempt of Me, committed a great offense against you. The punishment that you, devoted ones, awarded them, I approve, oh great sages, because they turned against you in enmity. I seek your forgiveness now because that offense against you, oh brahmins, who are the highest ones of God, is all Mine. I consider Myself the one who offended you since they who disrespected you are My attendants. When a servant does something wrong, one generally blames the one in whose name the offense was committed. It harms the reputation of that person as much as leprosy harms the skin. The nectar of the uncontaminated glories [of My name and fame] that reach one's ears, purifies the entire universe instantly, including the lowest of the low. I am that person of the freedom from laxity and foolishness, of Vaikunthha, and for you having attained the glory of that superior place of pilgrimage, I would even cut off My own arm if that place would work against you. Of those who serve in the dust of My sacred lotus feet, the sins are all wiped out instantly and therefrom I acquired such a disposition that, in spite of not being attached to her, the Goddess of Fortune never leaves Me, while others have to observe sacred vows to obtain the slightest favor from her. On the other hand I do not relish as much the oblations in the fire by the sacrificer who offers the ghee, that is abundantly mixed with the food, into that mouth of Mine, as I enjoy the bits of food that satisfy the mouths of the brahmins of engagement who dedicated the results of their actions to Me. If I with the power of My infinite and unhindered internal potency and with the Ganges water that washed from My feet, with which Lord S'iva instantly sanctifies the three worlds, manage to carry on My crown the holy dust of the brahmin's feet, then who would not [be capable of the same]? They who because their faculty of judgment is impaired by sin, consider the best of the twice-born souls, the cows and the defenseless creatures that are all part of My body, as being different from Me, will be torn apart by the furious, vulturelike messengers of the master of punishment like they were angry snakes [Yamarâja]. But I am controlled by the brahmins who [may] express themselves with criticism. Therefore those are in Me who, like being their sons, intelligently with gladdened hearts and with the nectar of their smiling lotus like faces, manage to recognize them with appreciative and loving words. Lord Brahmâ said: 'Even though they now had heard His loving, divine speech that was like a series of mantras, their souls, being bitten by the snake of anger, were not satisfied. With their ears wide open hearing the excellent and carefully chosen words of momentous import, they had difficulty understanding them and, pondering deeply over their profundity, could not fathom the Lord's intention. The great conclusion the Supreme Lord had revealed from His internal potency, made the four brahmins with folded hands speak in extreme delight with their hairs standing on end. The sages said: 'Oh Fortunate One, we do not understand what You are saying,, oh Lord, because You, despite being the ruler, spoke of [us] being merciful with You! You are the supreme director of the spiritual world and the highest authority of the brahmins. You, oh master of the learned souls, are the God of the gods, the Fortunate One who is the Soul, the worshipable deity. You, in all Your different appearances, constitute the protection of the eternal calling [sanâtana dharma], You are the supreme objective of the religious principles; in our opinion You are the one unchanging reality. Because the transcendentalists, who break with all material desires, by dint of Your mercy effortlessly conquer birth and death, it can never be so that You would depend on the mercy of others. The Grace of Fortune [the goddess Lakshmî], of whom others, in their wish for material benefit, occasionally accept on their heads the dust of her feet, waits upon You, anxious to secure a place equal to that of the king of the bumblebees that are after the aroma of the wreath of fresh tulsî leaves that is offered by the devotees. How can You, who as the reservoir of all opulences are not that anxious about her impeccable devotional services, You, who for the pure devotees are the object of the greatest devotion, be sanctified by the dust on the path of the brahmins or find fortune by the S'rîvatsa mark [the few white hairs on Your chest]? You, oh Fortunate One, are threefold [tapas, s'auca, dayâ] present in all the three [previous] yugas [see 3.11] for the protection of the animate and inanimate beings of this universe. May Your transcendental form consisting of pure goodness, for the sake of the gods and the brahmins, ban all ignorance and passion and thus bring us all the best. If You as the protector of the brahmins - the highest class - do not consider them worthy of Your protection, if You do not consider them the best who deserve all respect and should be addressed in friendly terms, then oh God, Your auspicious path will be lost, the path because of which the common people would accept the authority of their excellence. And that is not what You want. You, who as the reservoir of all goodness wishes to do good to the people in general, destroyed the opposition by Your potencies. Oh Lord, You are the one of the threefold of nature and the maintainer of the universe and therefore Your potency remains undiminished [by the role You are playing now]. That submissive attitude is but [a game to] Your pleasure. Brahmâ said: 'The sages had now to their delight seen the beautiful to behold, self-illuminated realm of Vaikunthha, the abode of the irresistible Lord. 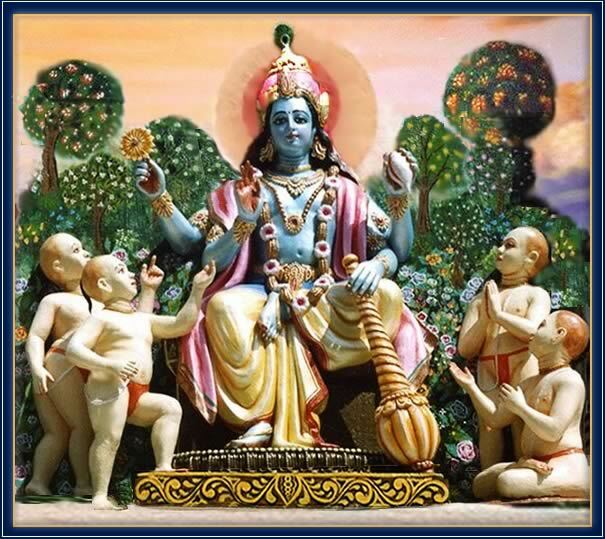 They circumambulated the Supreme Lord, offered their respects and returned elated, full of praise in having learned about the glory of the Vaishnavas [the attendants of Lord Vishnu]. The Supreme Lord then said to His two servants: 'Leave this place, let there be no fear, but live in solidarity. Even though I am capable of nullifying a brahmin's curse, I do not wish to do so, on the contrary, it has even My approval. This departure has been foreseen by Lakshmî who was angry with you when you once prevented her from entering the gate while I was resting. Thus having addressed the two doorkeepers, the Supreme Lord returned to His abode decorated with rows of palaces and full of the wealth [of the servitude] of the goddess Lakshmî. But that did not apply to the two excellent demigods who, because of the curse of the brahmins, inevitably had to miss the beauty and luster of Vaikunthha and fell into gloom. Upon the fall of the two from the abode of the Lord of Vaikunthha, a great cry of disappointment rose from the excellent palaces of the devotees. These two prominent associates of the Lord have now acquired access to the womb of Diti by the very powerful seed of Kaśyapa. Because the Supreme Lord wanted this to happen, you are all now being faced with the prowess of these two unenlightened siblings and unsettled as a consequence. is a mural in Mayapur, India.